Part of “a great place” – a series of engaging spaces for consideration…and perhaps inspiration for the people who build places everyday. 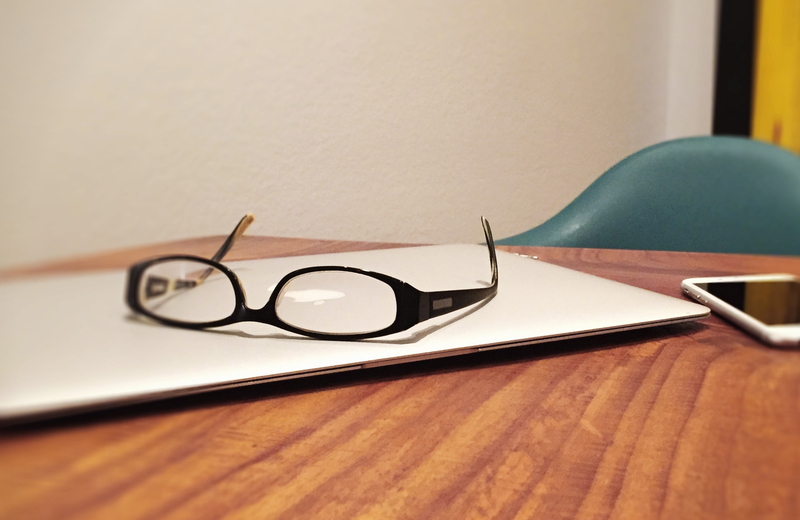 “How much design is too much design?” – the on-going challenge in building any product, including places. 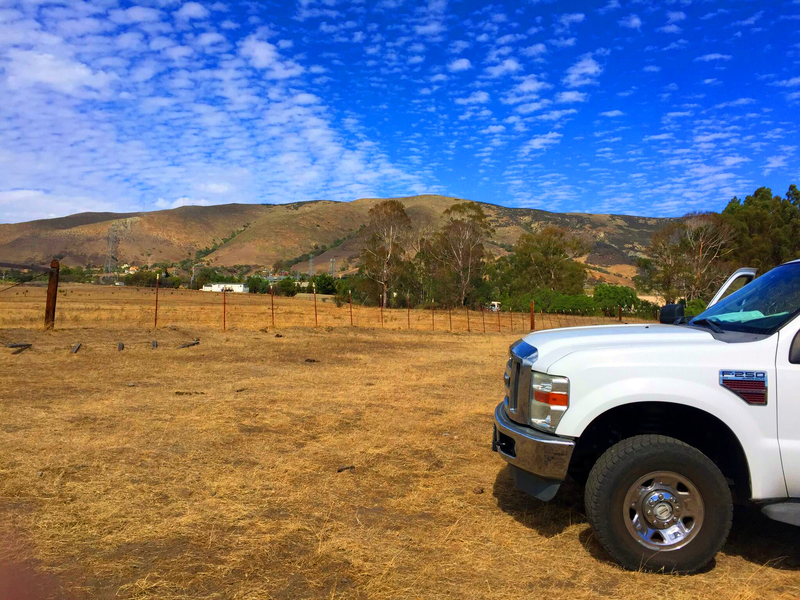 At the end of the day, development is a business and a major economic driver with employees, suppliers, contractors and yes – a profit requirement. 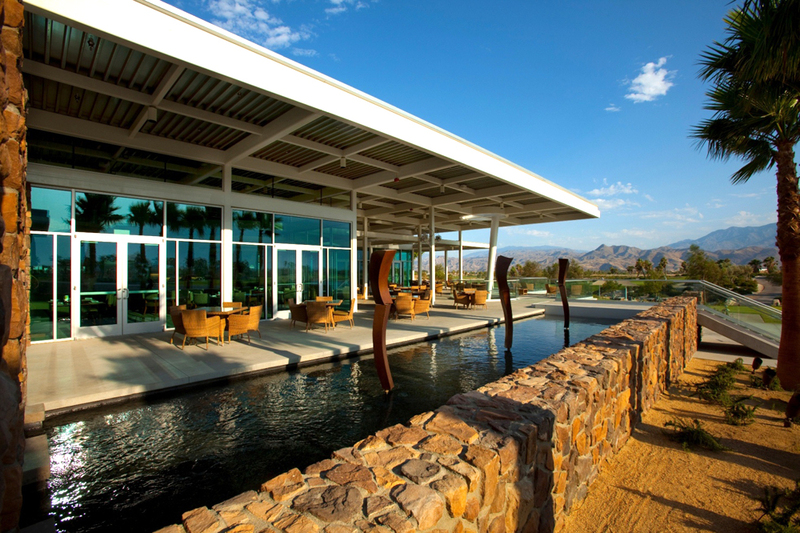 Bottom-line- New places need to “pencil” and the art is finding the balance of aesthetic design to financial feasibility. On one side- the “finance guys” don’t like risk & cheaper feels so-less-risky. On the other side- the “marketers” like to sell a product that people will actually find interesting & well…boring or ugly is so-less-sell-able. That said, at times going beyond the known in design creates a powerful brand that people find engaging and value (think Apple). The Result: premium pricing, faster sales and lower promotion costs. 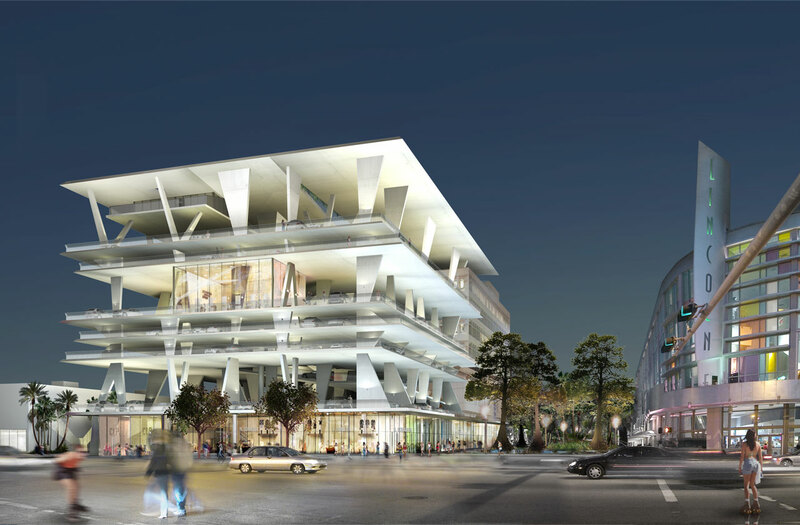 This much-lauded Miami project by Robert Wennett brings together high-end architecture by Herzog & de Meuron with the lowly parking garage for a mere $65 million (NY times 1/11). This complete re-imagining of a parking use responds brilliantly to the context of the property. Parking rates here are almost 400% the area average ($4 hour per car) and $12,000 -$15,000 (per event). (NY times 1/11). 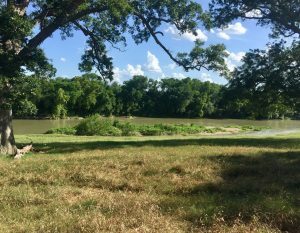 First a brief recap of the land and the context when acquired in 2005. Existing building with Brutalist architecture to remain. South Beach climate is warm, tropical (with storms) and outdoor living oriented. 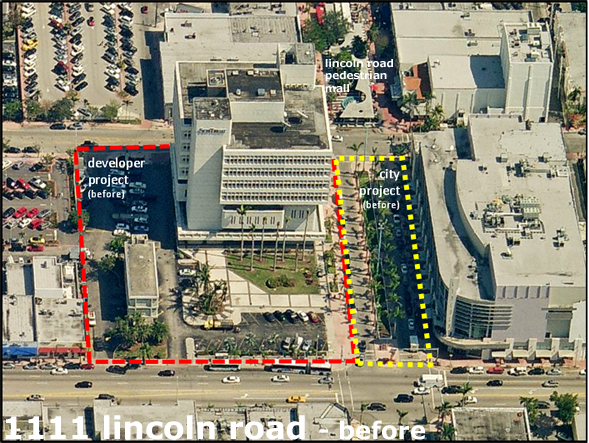 Famed pedestrian Lincoln Road outdoor mall almost adjacent to land. The model to the right is of an initial possibility. This less costly – concept may have appeared a great, safe answer to a “finance guy” – which would have been a shame. Enter Herzog & de Meuron. The architects saw an opportunity. 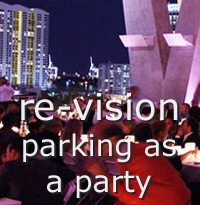 They set out to redefine the parking garage experience into more of a “car salon” with shops, bars, event and housing components. The massing of the garage was increased to match the existing building. The garage is airy and open responding to the climate and in contrast to the existing building, which brings a certain balance to the overall project. While garage height and cost to build increased significantly, the 255 parking spaces allowed did not. 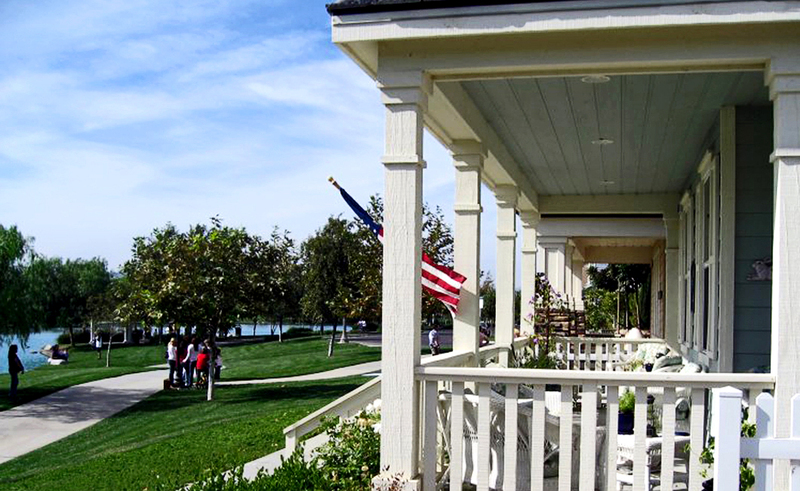 The multi-use programming of the project provides additional revenue streams. Luckily for the developer, the City redeveloped the block of Lincoln Road adjacent to the property into an extension of the Lincoln Road outdoor mall. That obviously added incredible value & facilitated prime retail into the ground level of both buildings. Once the decision was made to create a mix-use architectural statement of this caliber and incorporate it into the famed South Beach Lincoln Road lifestyle a brand began to develop of an uber-cool, high-profile international icon capable of attracting high-end leases, selling million+ condos and renting “parking space” for $12-$15K per event. 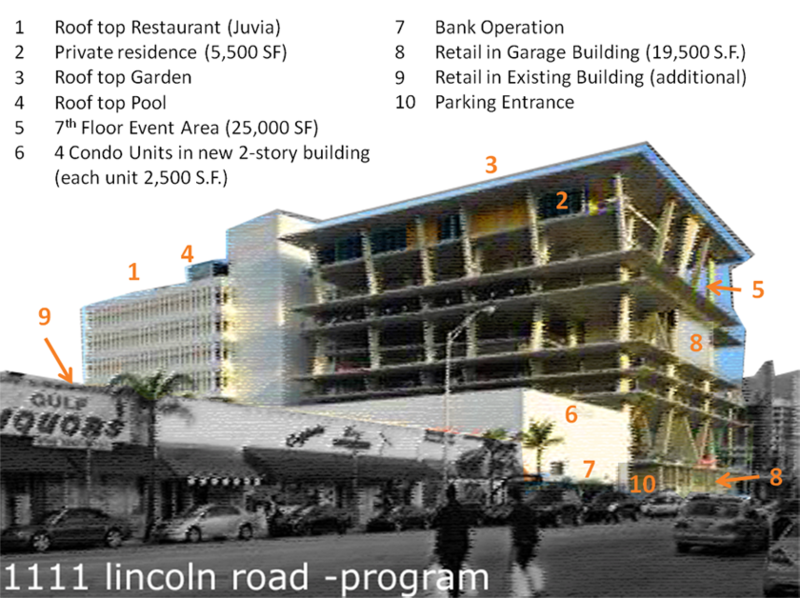 The brand of 1111 Lincoln Road began at the design stage of development. Promotion. 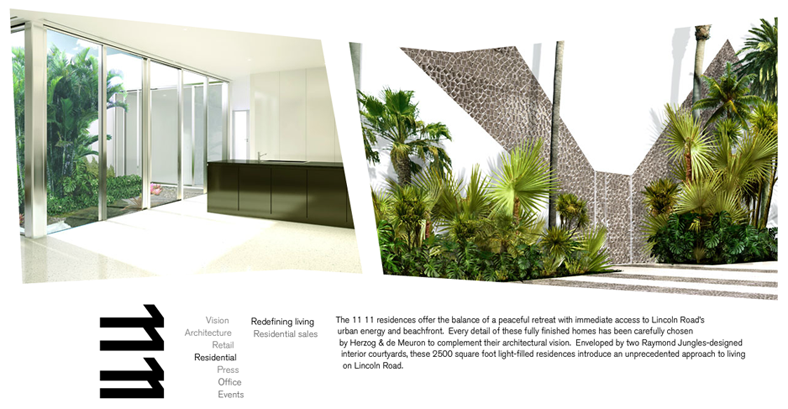 1111 Lincoln Road garnered international editorial press both online and offline. However the amount of user-generated content online is a huge component of the marketing mix and always focused on design – building the brand of an “uber-cool” design icon. For the truly interesting, social media is powerful. The developer marketing by TCBC /NY stayed consistent with the brand by visually mimicking the architecture as much as possible and conveying “Modern. Fast. Adaptable. 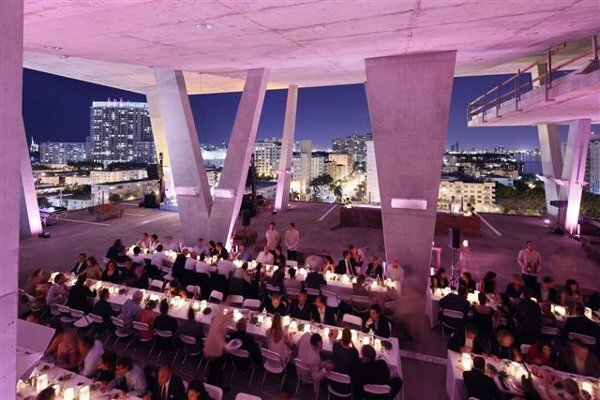 and Sensual.” Intentionally they built brand equity in 11 11 Lincoln Road that supported all uses -“retail, residential, dining and parking experiences”. On the events. While most of the weddings, wine tastings, private parties and corporate events take place on the 7th floor of the garage, Ferrari used the 5th, 6th & 7th beautifully. Note: the 11 11 brand of high design, modern, fast, and sensual is in the same brand personality space as Ferrari – a strong synergy. So do you love it..or not so much? Weigh in below or catch me on twitter at @HollyHM2. [If you would like an invite to Pinterest let me know below or on twitter – always happy to help ;) ] Coming soon…more on Pinterest – 10 million strong & growing.